Crossing The Finish Line At The Central Park Buddy Walk! 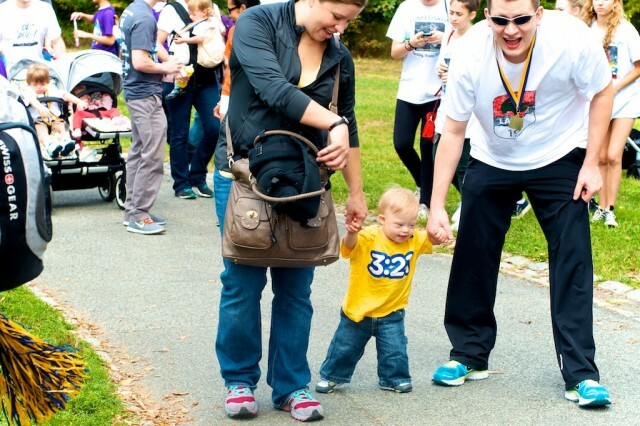 You are here: Home / Family / Crossing The Finish Line At The Central Park Buddy Walk! Crossing the finish line in Central Park! We just got home form a great weekend in New York. It was a quick trip, but we were glad we were able to go for a few reasons: Noah’s picture was selected to be in the National Down Syndrome Society’s Times Square kick off video (which we talk about in this interview.) In addition we wanted to be a part of the NDSS 2012 Buddy Walk in Central Park. However I did want to quickly share this photo of Noah crossing the finish line in Central Park. (Notice that I’m wearing Noah’s medal around my neck, he doesn’t like things on his neck and kept pulling it off.) This was such a special moment for me as a dad. I’m so proud of this little boy and all of great things he has accomplished in his short life. In case you couldn’t tell….I’m head over heels in love with this kid!